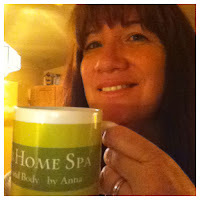 Natures Home Spa: Homemade Lotion Recipe for all skin types, babies too! Homemade Lotion Recipe for all skin types, babies too! I made this incredibly creamy lotion today with dried peppermint leaves steeped in rosewater for the liquid, and beeswax for the emulsifier. It is light and creamy, with the consistency of a body butter. The scent is subtle, floral, feminine, just lovely. even babies. Don't use any additives that you may be allergic to, of course! You can make this all natural recipe with distilled water in place of the rose water. 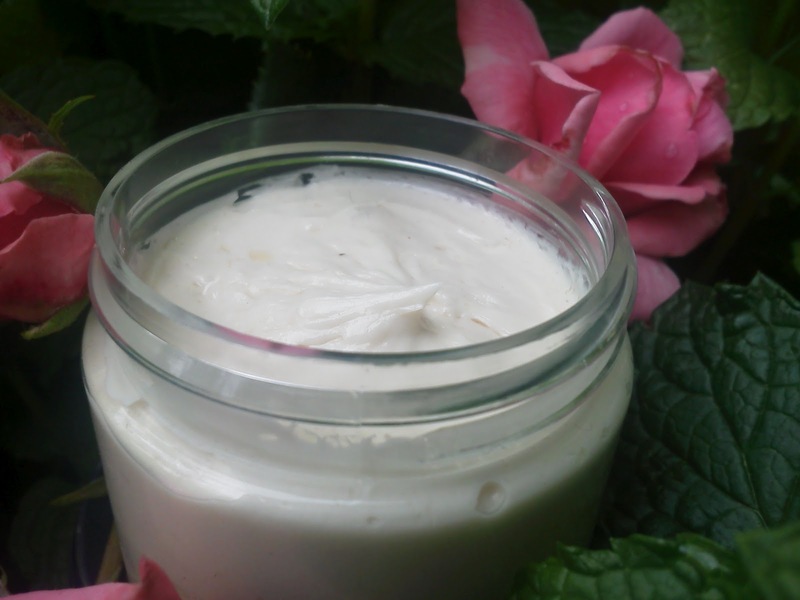 Easy to make in your own kitchen, this recipe makes 2 Cups of moisturizing, non greasy lotion. ____________________________________________________NOTE: This is intentionally a small batch as it has no preservative so that it can be used up in a few weeks. Kept in the frig it will last longer. You can make this in the blender or you can use a stick blender, I've done it both ways. Blender is messier. Sterilize all your equipment in bleach water or spritz with alcohol before pouring lotion in it. This lotion does not have any preservative, so please be sterile. Lotion can last appx. 3 months if properly sterilized, you can refrigerate it for longer shelf life. Add some vitamin E for skin benefits and boost longer shelf life. Melt the beeswax and oil together in a microwave or double boiler. It will be clear, no beeswax chips floating in it when it is done. Do not overheat in the microwave! Allow to cool down a few minutes. Warm your water. Put your water in the blender along with any essential oil if you are using any, turn blender on medium and slowly pour the melted oil/beeswax in thru the lid with the stopper removed. It will turn white, your are making lotion! It is done when you no longer see any water on top. If you still see water, turn up the blender and mix longer. Lotion will thicken as it sits. You will end up with a beautiful, creamy body butter. With no preservative, any bath and body product with water in it is prone to bacteria if not used up in time, so......pamper yourself and use that beautiful lotion you just made! Thanks for stopping by, Enjoy ! I love to read about natural care products you can make yourself! Would love to have you share this on Wildcrafting Wednesdays! I have been looking for a simple yet good recipe and this one's it! Hi- This morning when I checked my lotion, alot of the water had come out of the emulsion. Can you help? Did I just not mix it long enough? Hi Joyfulmom! Glad you tried the recipe, bummed it separated for you. Hmmm....let me think. If your beeswax and oil were all the way melted, and your water was in the blender, the blender turned on when you began pouring the wax/oil mix into the water, it should emulsify. I'm thinking it needed to be blended a bit longer or possibly it was the essential oils that didn't blend in. I've never tried it with peppermint e.o. but I have some, so I think I will try it out myself and see what happens. More than likely it just needed more blending time. Mine will have water on top after I blend, so I just turn up the blender speed and mix a bit longer. Did you try to reblend it with a stick blender maybe? Anyway, please don't be discouraged, try it again, I bet it will work great for you! I tried another batch and it worked fine. I think I just jumped the gun and stopped blending too soon. I used an immersion blender both times. Does it work better with a regular blender? The immersion blender got quite warm. How long would you say this lotion lasts safely since it has no preservative in it? Hi Joyfulmom, SO glad the lotion worked out for you! Yea! The regular blender is harder to clean etc, but it does seem to blend that lotion really well, I tend to use the stick blender because I make small batches, yep, mine got hot also. Homemade lotion can last as long as 4-6 weeks out of the frig, longer in the frig, dependent upon a few things...(1)sterilze, or spritz with alcohol all utensils, containers used for the lotion,(2) use distilled water, (3)clean hands when dipping into lotion (4)vitamin E in the recipe due to its anti bacterial qualities (5)store in airtight container in cool place. Your beautiful homemade lotion will basically only last as long as the oil in your recipe with the shortest shelf life. I make a batch that I know will get used up in a couple weeks, never had a problem kept in or out of the frig. I like to keep a small jar by my bedside. Isn't it rewarding to see that lovely lotion come out of your natural ingredients! Send a picture if you'd like and I'll post it here! Hi, just wondering if I use shaved beeswax should it still be 3 T? Thanks! Hi Tammy, good question... 1TBL of beeswax is .5 oz. So, 3 TBL of beeswax is 1 1/2 oz by weight. If I buy the beeswax chips I measure by TBL, if I have to shave a solid chunk of beeswax I measure it by weight. I think I'll update the post with this, thanks for drawing my attention to this! Thank you Gail for your prayers, I will pray for you as well, for healing. Do you think it is better if you add a little xantham gum or wheat starch to the distilled water then add into the oil to blend since water will separate from the oil? Jezzy, thanks for the comment. I don't know about adding the gum or wheat starch to this recipe, sorry, never tried that. Let me know if you try it though. The beeswax in the recipe is not a true emulsifier, but it "acts" like one, and properly prepared as in the instructions, will indeed make a lovely lotion. It is meant to be made in small quantities and used fresh. The only time I had some water separate out was when I didn't blend it long enough. So, I just blended a few more minutes and it was fine. Have made it many times! A tip is to have the oils and water around the same temperature when combining. Trust me it works! Kari, so glad you are making your own lotion, it's so much fun. Do you mean in this particular recipe or in general? For this recipe, if you are sure you measured properly, I don't know why it was so hard to mix. It works better if the oils and water are approximately the same temp when combining. Also let the oils cool down a little, they have to get pretty hot to melt that beeswax! If you are blending and they start to emulsify and you see little beads of water on top of the lotion, just keep blending a few more minutes. Hi! Thanks for the recipe. I' ve tried your recipe with little bit of alteration where I ve mixed the coconut oil portion with half of cocoa butter. I also did not add any essential oil into it. It came out very well and I just love the smell and texture. Subha, to me the fun part of homemade natural recipes is "making it your own". I love how you made the recipe your own style! You know, I've never made this with cocoa butter, but I am going to try it. You wouldn't need any scent or EO with lovely cocoa butter. Thanks for sharing! This has been a great recipe for lotion for me, and I've even passed it along (with your link) to others for whom I've made it in the past because they've loved it as well. I, too, have trouble getting all the water incorporated sometimes. I know it's extremely finicky about temperature, and I often wonder if altitude has something to do with it as well (I'm in CO, 1000' higher than Denver). The great thing is that the ingredients aren't outrageously expensive, and even a "bad" batch still works great! This recipe sounds delightful. I will definitely try it. I was wondering how i could make it thinner. I am looking for a recipe that I can put into a squeezable container rather than a thicker body butter consistancy. Do you think less beeswax would work? I made this lotion just now and it didn't turn out that well, it's quite oily (I used olive oil) and I can see some water droplets. I'm pretty sure I followed all the instructions. It's not terrible but I would like to know if there is anyway that I could fix this? Hi RealWorldGirl, As to the greasiness ... I'm thinking it is the olive oil. Olive oil is fabulous for our skin, but it is a heavy oil and stays on the surface of the skin longer than say, grapeseed oil. I probably should put that somewhere in the post, I just wanted to give a list of oils that are easy to come by. I make mine with grapeseed oil, which has a shorter shelf life, so I add vit.E , or a mixture of grapeseed and shea or cocoa butter. Grapeseed is not greasy, absorbs quickly and pulls the other oils down with it. As to the water droplets: I have had that happen once or twice and blended longer and it was ok. Only once did it not work and I blamed it on the essential oil I added. What helps is to have the water and oil around the same temperature when you combine them. As for fixing it now ... you could try gently reheating it, and reblending. Honestly, I'm not sure. But, please don't get discouraged, making all natural products is a lot of fun AND a lot of trial and error. There are many variables!